Border Police raid of Rahat yields weapons stash hiddein in a car; 2 suspects taken in for questioning. 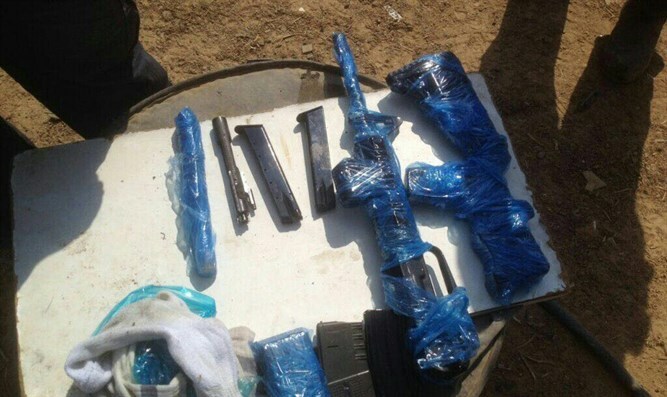 Border Police troops raided a compound in the Bedouin city of Rahat in the Negev this afternoon (Tuesday), searching for illegal weaponry. The compound serves as a facility for the dismantling of cars for sale as parts, among other things. During the sweep, one of the police dogs detected something in one of the cars parked in the area. The soldiers began searching through the car and its immediate surroundings. A thorough search revealed a hole under the back seat of the car, in which a large amount of weaponry was found, including an assault rifle and several magazines of ammunition for an M-16 rifle. Two men were arrested in connection with possession of the arms. The suspects are relatives, 21 and 39 years old, and are residents of Rahat. They were taken in for further questioning by the police. Israel police said in a statement: "The police will relentlessly pursue the fight against those who possess illegal arms in order to prevent the use of these weapons in criminal or terrorist activities."